Tilly shines bright in the first Short Treks minisode. I had a few misgivings about the first season of Star Trek: Discovery, but one of my biggest was that it felt like the ensemble aspect of Trek was shortchanged by the story’s focus on Michael Burnham’s wild journey. I wanted more time to get to know, and be invested in, the supporting cast. Short Treks could be the thing that does that. CBS All Access launched the first in a four-part monthly series called Short Treks yesterday, a series of minisodes each focusing on a particular character from Discovery’s cast. The first, “Runaway,” put the spotlight on Mary Wiseman’s loveably fresh-faced theoretical engineer Sylvia Tilly. 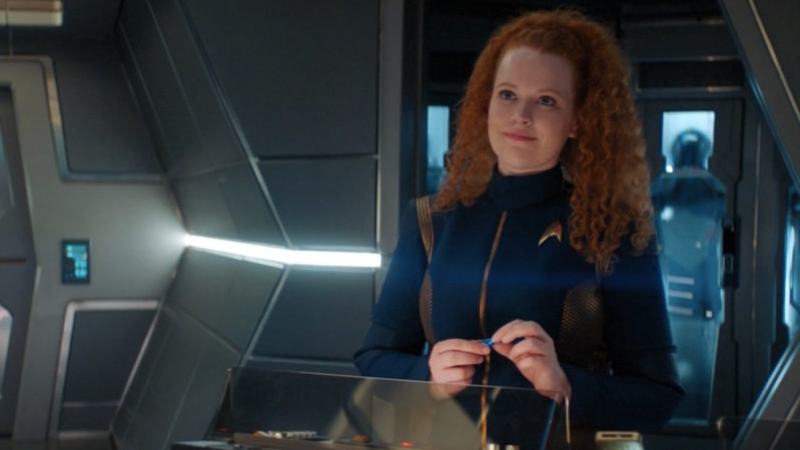 While in Discovery’s first season Tilly acted as an emotional grounding-rod for the main character—a friendly foil for Michael’s often icy veneer—here Tilly steps into the spotlight for a moment to deal with her own struggles. Tilly’s Mom concern-trolls her over her decision to try the Command program. Those struggles, initially, involve wrestling with her decision to enter Starfleet’s Command program, something she was slowly building towards throughout the first season of Discovery. While there we got to see Michael push Tilly to ignore her doubts, here, they begin to flare up again. That’s thanks to a call from her mother (played by Mimi Kuzyk), who is a clear source for many of Tilly’s own self doubts, as she puts her daughter down for even daring to think she could make it through the Command track’s rigorous training. Back off, Tilly’s Mom! Rude. We, of course, get to see just why Tilly is perfectly suited for command in the rest of the short. After escaping her mother’s holocall to drown her sorrows in a very unrecommended amount of caffeine, she encounters the titular runaway: Po (Yadira Guevara-Prip), a self-cloaking alien stowaway who, if incredibly standoffish at first, seems a lot like Tilly, razor-smart with tech and more pep than she knows what to do with. Like all good Trek first encounters, Po and Tilly’s tête-à-tête is at first brusque and full of tension, only for alien and human alike to find common ground in their individual struggles. After some initial standoff, Po and Tilly begin to bond. Po, it turns out, is royalty from a planet called Xahea, a politically-crucial world undergoing the first stages of becoming warp capable, partially in thanks to Po’s own technological wizardry in developing a way to stabilize and contain Dilithium crystals (in Star Trek lore, that’s the mineral that basically makes warp travel possible). She was just, as she puts it to Tilly, “being extraordinary,” but the combined pressures of her small world being elevated to a position of galactic importance and her impending ascendancy to rulership drove her away from the planet she loved. She’s fearful of the big changes heading to Xahea—like the ecological impact of mining Dilithium, something she helped pioneer with her inventive knowhow—and whether or not she can handle the pressure of leadership. Sound familiar? Sure, Tilly might not be a space princess (at least, in the matters of actual royalty rather than simply in our hearts), but the fear of a volatile world—after all, she did just make it out of a pretty horrifying war partially caused by her sort of best friend!—and whether she can handle being a leader are all too familiar to her. And we know that she can overcome them, because she, in turn, helps Po overcome them. Throughout it all, she’s still the Tilly we know and love—excitable and more than a little goofy (and knowingly so at this point: Po’s arrival turns the mess hall into a food-covered disaster, so when some fellow crewmates show up Tilly hilariously and deftly covers for it by pretending an alien rabbit escaped and caused havoc). But her compassion and supportive nature have forged Tilly into someone who can inspire others around her. In helping Po realize she’s ready to be Xahea’s queen in a new era, Tilly starts to accept in herself, regardless of what her mother says, that she is ready for Command. Oh, so Mary Wiseman’s just gonna start giving Anthony Rapp a run for io9's coveted “The Best Faces on Star Trek: Discovery” rankings now, apparently. It’s a small and simple little story, but it’s a huge moment for Tilly as a character—and it’s the sort of character arc Discovery’s first season often missed out on while it was busy focusing on the very specific beats of Burnham’s journey and the immediate people around her, like Lorca and Georgiou. The morality-play vibe of Tilly and Po’s encounter is classic comfort-food Trek, capturing that lovingly familiar feeling of the franchise’s best little character-building moments. Those side stories that formed the underpinning of episodes while not necessarily being the main plot focus—the stories that let us get to know and fall in love with Star Trek’s whole crews’ worth of heroes—are as vital to Star Trek’s heart as the boldly going and the strange new worlds. As glad as I am that Short Treks is delivering them, I’m almost a little sad that they’re not actually integrated into Discovery itself—because keeping these vignettes isolated (and for viewers outside of the U.S. and Canada, currently legally inaccessible) makes them seem inconsequential to the ongoing story of the show. The excellence of “Runaway” not only sets a high standard for the next three Short Treks, it also proves that the moments it reveals should be anything but unimportant.